Miharu of Ozegahara (尾瀬ケ原) is the most famous spot of Oze, Fukushima. Oze is one of the most popular hiking spot in Kanto Region. Oze is located at the boarder of Fukushima and Gunma Prefecture. Ozegahara is a marshland and forest located high up in the mountain. The altitude Ozegahara is 1,400m from the sea level. Because of its rich nature, it is designated as national park and natural monument. There are many beautiful mountain flowers, wild animals and birds. The water is so pure and it offers great hiking with nature. The view of Oze is also registered as 100 views of Japan. There are two wooden passes for trekking. Walk on the right pass. Miharu site has a mountain house where you can buy some food, drink. Take all garbage with you. There are bears, so be careful. There is camping place at Miharu. It is located in Oze. Nearest parking is Miike entrance. There is a bus from Aizukogenozeguchi Station. Ozegahara is the main feature of Oze. 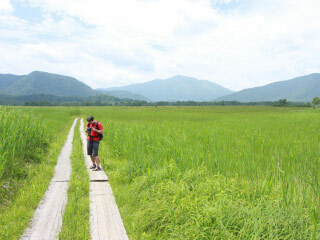 It is the huge marshland surrounded by over 2,000 high mountains. The marshland itself is about 1,400m high from the sea level. The marshland makes many ponds and gallery forest. Water from the mountains gather at Ozegahara and run into Sanjo Falls. Ozegahara is very famous for Asian Skunk cabbage and Daylily. Skunk Cabbage blooms from May to July. Oze was formed in the Ice age. The plants of Oze are mostly cold district plants that started habituating during the Ice age. When the ice age was over, most of the plants are replaced from warm land plants. However, Oze was located high up in the mountain, those plants of ice age survived today.